Joshua A. Weinshank focuses his practice in the areas of Trust and Estate Planning, Elder Law, and Trust and Probate administration. Last fall he oversaw the opening of Cramer & Anderson’s new office in Ridgefield, where he is the Resident Partner. Attorney Weinshank advises clients on ways to effectively and efficiently preserve and create intergenerational wealth by addressing their tax and personal concerns. His approach to estate planning takes into account clients’ entire portfolios and goals. Attorney Weinshank works with his clients to implement strategies to reduce estate and gift taxes, as well as addressing income tax concerns through the management of capital gains and the appreciation of assets. Attorney Weinshank also focuses on asset protection and Title XIX (Medicaid) Planning. He effectively advises clients on ways to preserve their assets while qualifying for governmental assistance programs. His experience in the area of probate law, and estate and trust administration, has earned him a winning record representing beneficiaries and fiduciaries in contested probate proceedings in the Connecticut Probate Courts. Attorney Weinshank is the Fairfield County Trust and Estate Planning and Administration Group Leader for the firm. He choreographed a vision to grow the firm’s business by bringing Cramer & Anderson’s sophisticated team approach and personalized advocacy to clients throughout Fairfield County. Attorney Weinshank makes community-minded activism a priority, and last fall he was named to the Finance Committee of the Ridgefield Visiting Nurse Association (RVNA). Around the same time he also joined the Board of The Ridgefield Playhouse, the landmark nonprofit cultural hub that presents a wide variety of national and local acts in a restored, Cass Gilbert Jr.-designed theater in Ridgefield. Additionally, Attorney Weinshank was recently named to the Associate Board of the Danbury and New Milford Hospital Foundation. In part for his community volunteer efforts, Attorney Weinshank was named a 2017 New Leader in the Law as part of the Connecticut Law Tribune’s annual statewide Professional Excellence Awards. 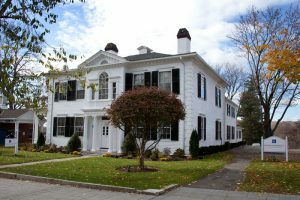 Attorney Weinshank joined Cramer & Anderson after years of practice with a large law firm located on Connecticut’s Fairfield County shoreline. He received an LL.M. in Estate Planning and Elder Law from Western New England University School of Law. He also received his J.D. from Western New England University, where he received five CALI Excellence Awards in various subjects and was the assistant editor of the University’s Law Review. While in law school, Attorney Weinshank cycled across the country to raise money for Lea’s Foundation for Leukemia Research, Inc. A competitive skier and coach for many years at Stratton Mountain in Vermont, Attorney Weinshank is an avid outdoorsman and sports enthusiast. He lives in Ridgefield. Managing Director, The Stevek Foundation, Inc.
How 4 Business Owners LEFT $100 Million on the Table!